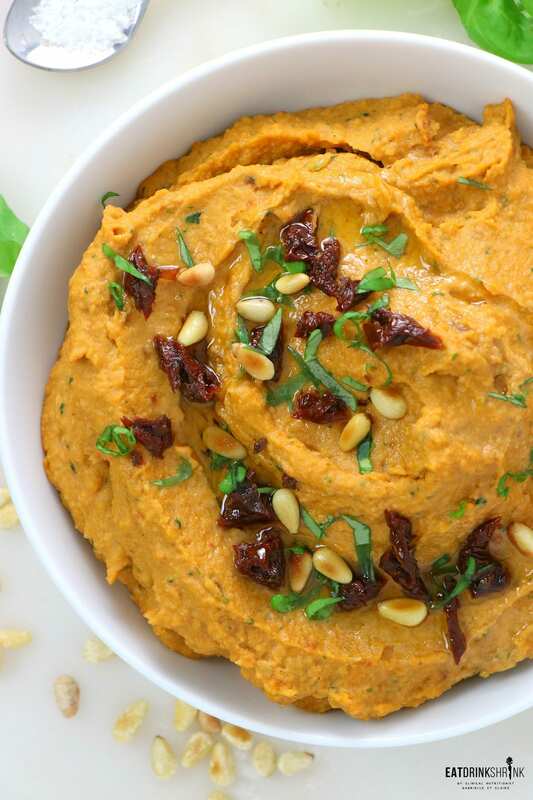 Vegan Tomato Basil Hummus - Eat. Drink. Shrink. Long before 2019, there was literally 2 companies that featured ready made hummus. 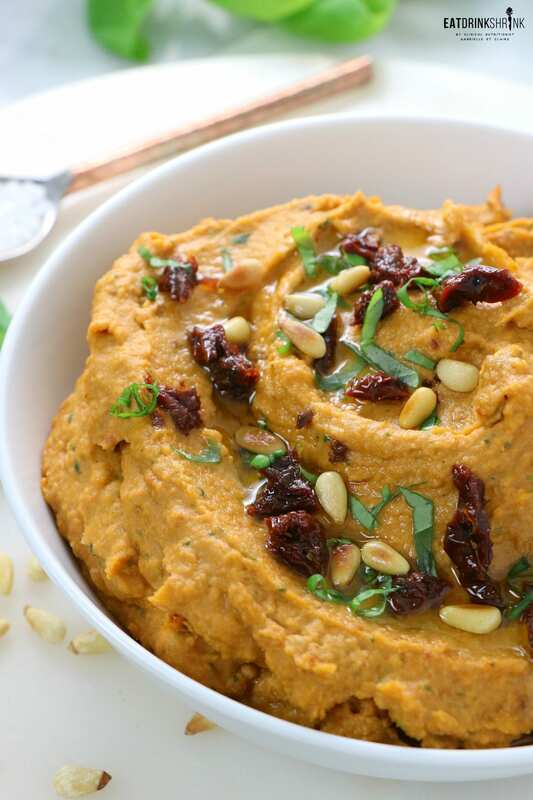 While hummus is quick and easy, that arena exploded and you can find countless flavor from savory to even sweet. However, hummus is so easy, you can skip all the preservatives and potential additives and just make it yourself. Yesterday I had a random craving for hummus, but if you know me, you know I don’t just do plain jane hummus. You’re working with a blank slate, so always have fun with it. One of my favorite flavor combos is tomato and basil. It’s my favorite soup recipe and this hummus also delivers! What’s fab about this dish, is everything! It’s your quick and easy hummus recipe, packed with sun dried tomatoes, fresh basil, packs tons of plant based protein, packs flavor, perfect for any season, perfect for entertaining, can easily be made in bulk, affordable, perf veggie dip or even a topping for sandwiches !! 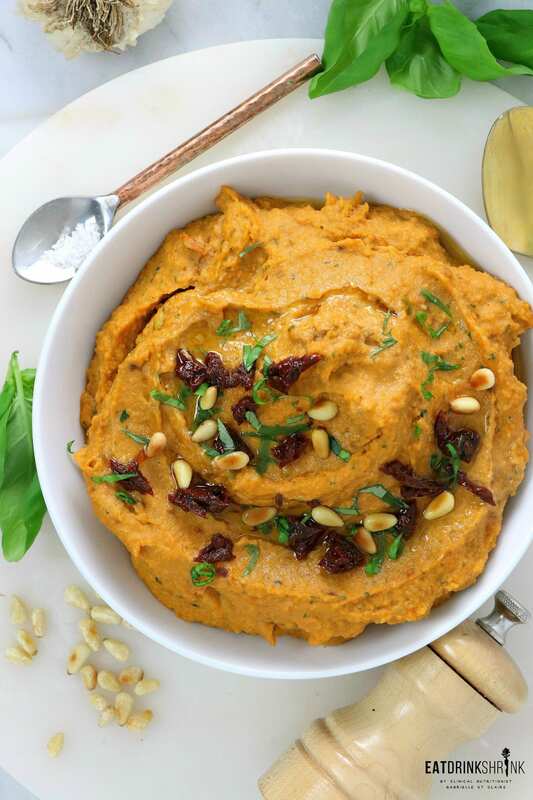 If you’re searching for a modern hummus you have to try this vegan Tomato Basil Hummus with toasted pine nuts!! Add all the ingredients to a food processor, minus the basil, and pulse for 1 minute, scraping down the sides, pulse again. If the consistency is still too thick, gradually add the liquid from the chick pea cans to smooth it out and combine for another 2 - 3 minutes longer. Add the chopped basil and pulse a few more times. You can add it in the beginning, but this will give more aesthetic appeal to see the basil. To serve drizzle with a lil olive oil and garnish with sliced basil and chopped sun dried tomatoes. Serve with pita chips or fresh veggies.